1996 was the last year I had cable. There has been a month or two since that I've done some viewing via rabbit-eared antennae. But otherwise, whenever I've been in the presence of someone else's TV and remote, I've sought out The Simpsons reruns, baseball games, and SportCenter. And Food Network, to see if there are any cleavage-baring cuties peeling cucumbers. 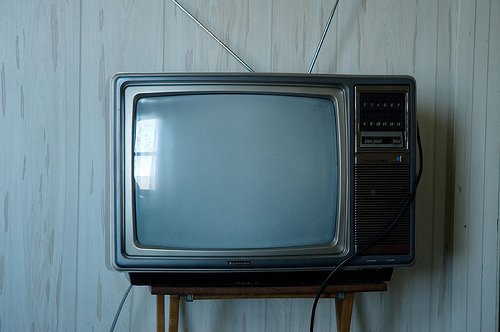 Last year, to my wife's joy, I agreed that we should get cable television in our home. We each have been doing some catching up with series on Netflix so that we're in the proper episode-viewing window for our chosen shows. So after binging on drama series for the last few weeks, I have decidedly changed a long held stance. Anyone who writes for contemporary audiences in ANY medium must watch television. If he brags about not doing so, then he is an a$$hole. If he fully avoids it, then he is a fool. And I have an a$$hole and a fool. Aside from the novel, there is no better opportunity for subtle character development and complex plotting based off multi-tiered conflict. Feature films cannot compete. Once a show is picked up for a season there is considerably less meddling by studio/network brass than in major features. Not that there isn't some heavy note-giving, but there isn't time to work out those external criticisms in time for airing. A bunch of writers are hired and they build the ship with the show runner(s). A feature screenplay can undergo two or three years of rewriting, but television episodes need to be worked out within months or weeks. And then there's the actual breadth of storytelling time. A feature film has to get in and out of the story within two hours. A cable drama series gets over ten hours per season (minus ad space). Network dramas often have over sixteen hours (minus ad space) per season. I don't care how many sequels one gets to release on one's feature, there just isn't the same opportunity to tell an expanded story. And television is how people have been primarily consuming stories for over a generation. They pay for it so that it's pumped into their home like electricity. Because it's a steady monthly billing process, no one feels like they have to dish out $10 or $15 for individual viewing experiences like cinema. It's there, in front of their couch, ready to deliver lifetimes' worth of tales for consumption. That's not to say that all of the product is good. Most is not. Having more canvas doesn't make one's art better. It's very easy to get lazy with so much room to maneuver. Beautiful things can be honed within small spaces. But the chance to develop a new epic, week by week, as an almost live experience is worth all of the failures leading up to it. A lot of television drama is just closed procedural, each episode solves a conflict within an hour without any further development from show to show. Some of it is much more open, developing a larger story bite by bite, cliffhanger by cliffhanger, as Dickens and his contemporaries used to. Some incorporates both closed and open storytelling, having conflicts presented and solved in individual episodes while gradually revealing a much larger story each week. I know that this has been the equivalent of me saying, "So that color in the sky there is blue. And the white fluffy stuff is clouds." But there's a difference between understanding this in theory and appreciating it for the evolutionary storytelling process that it is. I'm new to this whole TV-watching thing. And though I'm largely doing my viewing under the guise of an obsessed researcher in a foreign country, I can understand why humans enjoy this stuff.